A great deal of travelling was done on Thursday 18th September — lots of Newsfield staff members put on their suits, clambered into a fleet of vehicles and zoomed off to London, setting out before dawn. And several hundred CRASH, ZZAP! and AMTIX! readers headed towards a rendezvous in London on the same day. Why? Well, Newsfield was hosting a party in the famous Camden Palace disco to launch a new magazine to advertisers. Readers of Newsfield’s computer magazines were invited to join in the fun at the LM Launch Party. A tiny bit of ‘Us and Them’ was involved: while Gaz Top (of Get Fresh fame) hosted the disco and gave away lots of freebies on the ground floor of the Palace, the people who control huge advertising budgets and industry figures such as Ian Stewart from Gremlin Graphics, Tim Chaney from US Gold, Paula Byrne from Rainbird and Ted Heathcote from Gargoyle Games looked on from the balconies. The LM Editorial team as you’ll probably never ever see them again — all in suits. Gaz Top, the one with the hat, isn’t part of the LM Editorial team, so he’s not wearing a suit! Jane Stanton reads the script for a camera commercial — part of the competition which ended up with Jane winning a Konica camera kit! Whilst strategy freaks twiddle their thumbs waiting for the next Kevin Toms biggie President, they can take a nostalgic trip down memory lane with a repackaged version of the slightly aged classic Football Manager. This new version comes in a double cassette package, has had the names of the players updated, but otherwise is the same game you knew and loved back in 1982. Oh yes, there’s a competition to win a trip to the 1987 Cup Final inside. A company spokesman seemed a bit vague about the price — ‘shop around and you might get it for less than a fiver’ is about as definite as he’d get. Another hoary old chestnut getting a quick lick of paint is Gyron. This didn’t sell awfully well when it was released as a full price game over a year ago, but now it has been rereleased on Firebird’s Silver range at £1.99. The game features the previously unreleased Arena maze — played as the tiebreaker in a competition run with the game when it was initially released. The winner of this competition managed it in 18 minutes, can you solve the maze faster? If you are a Gyron fan, you’ll want to have a look at this new maze. Alternatively, if the game has never appealed to you before, at this price, it might well be worth a look. Mikro-Gen has a suitably seasonal theme to the first of its winter releases. Frost Byte is set in the frosty planet Cosmia. The battle for freedom, enlightenment, and all those nice things is being lost by the Kreezers who have been captured by the ghoulish monsters who inhabit the planet’s craters. The player controls a Kreezer — that looks and behaves rather like a Slinky spring. The hero has managed to escape the evil clutches of his captors and must now escape from the crater, freeing five fellow Kreezers on the way, and then leading the Front Liberation aux Kreezer (FLAK) to victory. It’s an arcade adventure with shoot-em-up overtones and looks rather pretty — it’s in line for a full review next month. Everso sorry, folks. Promise it won’t happen again. Also arriving just too late for the reviewing team to get stuck into was Galvan from Imagine — another coin-op conversion. A quick look at the game reveals it to be a huge arcade shoot ’em up where the lead character, Galvan, is faced by a whole host of meanies. Some nifty footwork is needed to move around the screen, as well as combat skills. Galvan starts off with just his bare hands, but gradually acquires more powerful weapons. At the end of each level, a huge Demon appears which has to be blasted apart piece by piece. Just as the magazine was going to bed, a cassette tied round a half brick came crashing through the windows of CRASH Towers. When we feverishly untied the package, it was found to be The Great Escape making its escape from Ocean. From those whiz programming Liverpudlians, Denton Designs, it’s all about getting out of a POW camp. You control a prisoner walking around a large 3D scrolling landscape. Whilst working out your escape route, you’ve got to keep the old chin up by collecting red cross parcels, and keep your nose clean by attending roll call. Also on the late gate-crashers’ list is Ice Temple from Bubble Bus. From the hitherto little known Tom Prosser, it is an arcade adventure all about zipping about, picking up some things and zapping others in a huge cave system. The hero, Nick Razor, stumbles into the 800 screen Ice Temple in search of his stolen motor and realises that he has entered a huge alien thermionic reactor that threatens to turn everything into an icy waste. Find that car, Nicky babe and disable the reactor before we all freeze our socks off! Already the first rush to compile older hits in time for Christmas is happening. Both Durell and Virgin have just released compilations, which must put them ahead of the crowd of software houses that will soon be going for the Chrissie Stocking market. Virgin has Now Games 3 — no prizes for guessing that this is a sequel to the company’s two previous efforts. The line up for this one is Nick Faldo Plays the Open from the Argus Mind Games label, Codename Mat II and View to a Kill from Domark, Everyone’s a Wally from Mikro-Gen. Virgin are also releasing a new version of their own hit game Sorcery on the tape, featuring improved graphics and extra rooms. Durell has a very strong line-up for its compilation modestly entitled Big 4. 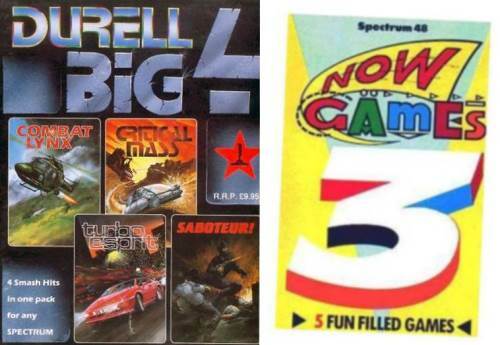 The four titles are all Durell games of varying vintages that were all rated very highly by CRASH in their time. The big four in question are Combat Lynx, Critical Mass, Turbo Esprit and Saboteur. Despite indications given at the PCW Show that the new Spectrum would be available from the end of September, there’s still no sign of the Spectrum Plus 2 — in the Ludlow shops, anyway! According to other High Street retailers we contacted (on October 8th), Plus Twos are not available for them to order from their head offices, and there is no retail price available yet. This could mean that the machines are still at least three weeks away from chainstore branches. During this waiting period, the older Spectrum Plus and 128K models have been discounted by several retailers. Comet are quoting £69.99 for the Plus and £99.99 for the 128, whilst Dixons/Currys is offering deals on the two models which include cassette recorders and joysticks for £109.99 and £129.99 respectively. As we went to press, a spokesperson at Amstrad said that shipments of the Plus Two had started. Amstrad Distribution claimed to have shipped some machines to independent retailers, and claimed that Dixons have taken a shipment, so the Plus Two should be available by the time you read this. Early Plus Twos apparently had problems when it came to working with a domestic colour TV — but Amstrad claim there have been no technical problems with the machine, and that the only difficulties they had at the PCW show were caused by the TVs being used.